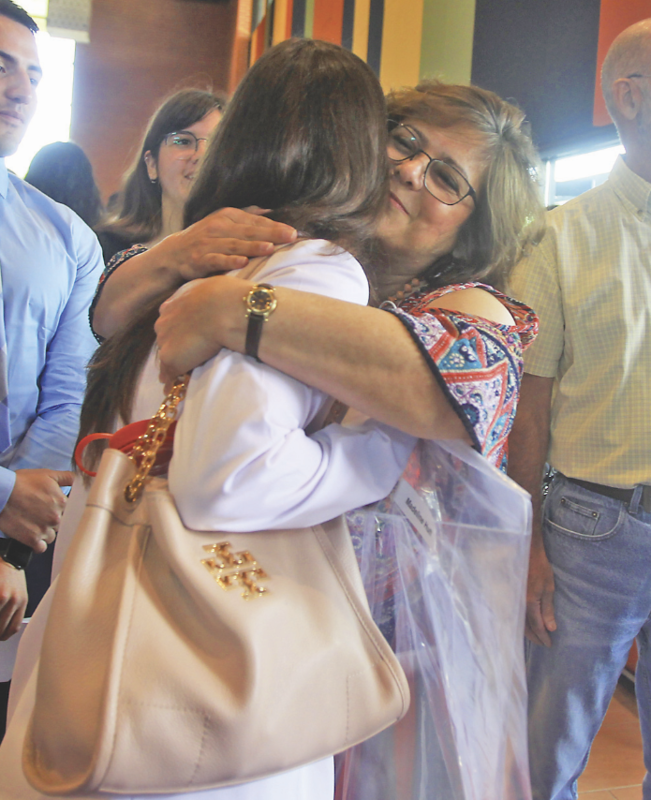 HARLINGEN — The room quickly turned emotional as family, friends and possible new mentors watched 56 students get cloaked with their white coat as they prepare to begin the first year of medical school at the University of Texas Rio Grande Valley. 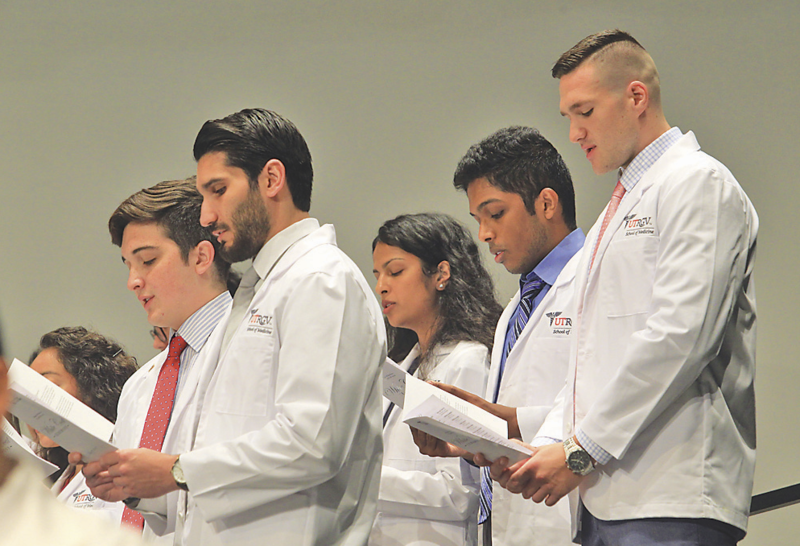 This is the third cohort to walk the stage to receive the ceremonial white coat for the UTRGV School of Medicine, which opened its doors in 2016. 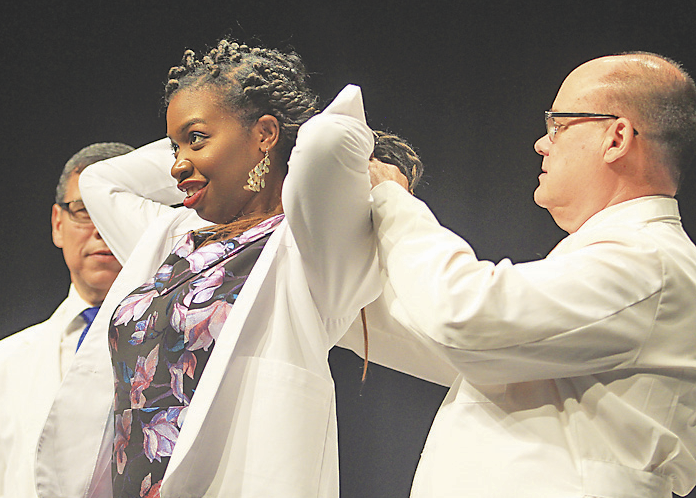 And this time the event was hosted at the Harlingen school district’s Performing Arts Center, a city in which the region-wide university has a campus and several clinics for these students to practice medicine. The ceremony was led by Dr. Leonel Vela, senior associate dean for education and academic affairs at UTRGV School of Medicine, who introduced school officers as well as the keynote speaker, Dr. John Prescott, chief academic officer at the Association of American Medical Colleges. Prescott had the opportunity to meet the students Friday, he said, and talked to them about some of the lessons he learned throughout his more than 30-year career in medicine which above all, he said, reminded him to remain humble, interested in learning every day and focused on providing a service to the community. The students also received their first homework assignment, or prescription of sorts, from Prescott, as he told them to take some time that same day to write a letter to themselves in which they describe the physician they hope to be, their dreams and aspirations of themselves and the profession. The letter is not to be opened until 10 years have passed, he specified, so that it can serve as a reminder of where they want to be in 10 years and a self-evaluation of whether or not they have managed to remain true to their aspirations. The diverse group of students includes 14 who are from the Valley, some who left the area to complete their bachelor’s degree and came back and others who have taken the opportunity to complete all their education close to home. 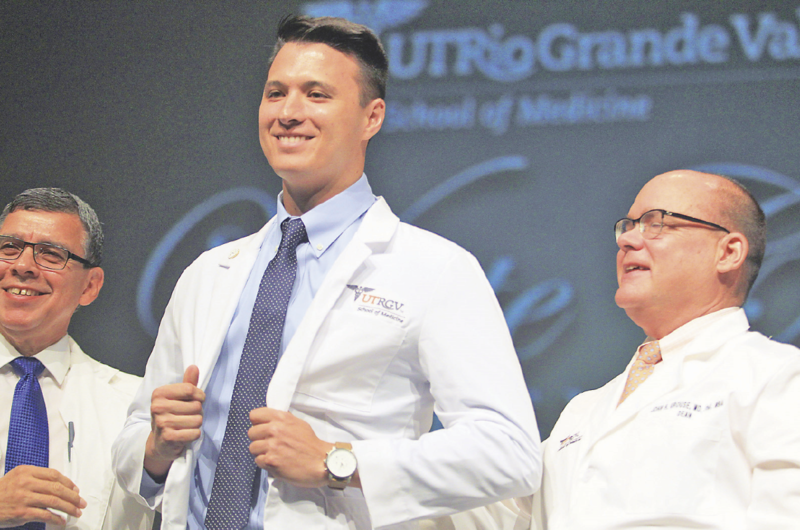 That is the case of Rodolfo Singleterry, of Mission, who was excited to have the ability to stay home during his entire education, as he received his bachelor’s from UTRGV before being accepted at the School of Medicine. The 25-year-old was not only happy to have been able to invite his extended family and friend to this event, but said he was eager to get the skills needed to practice and serve the community he grew up in. And just like Singleterry, his new classmate Onyechi said it was the interest of servicing these communities that attracted her to the recently-created institution. Onyechi, 25, said previous exposure to the area through missionary trips as an undergraduate at Baylor University, encouraged her to apply at the UTRGV School of Medicine. Those trips, even though short, exposed her to the need in the community, but she said she felt the need to be here long term to also experience the impact that their services could make.